Binary Options have been forbidden by ESMA in Europe. Spectre is a great alternative without any chance for broker fraud! Spectre.ai is a blockchain trading platform that was launched in March 2018. Spectre has removed the broker and replaced it with a decentralized liquidity pool. You can trade directly from your crypto wallet which means you never have to fund your account and you never have to ask for a withdrawal. You can also use Uphold which gives you access to the platform with fiat money like US dollars, so you don't have to be familiar with the use of cryptocurrency. In 2019 there will be more options available for using fiat money to fund your account and there will be a big upgrade on the graphical user interface. An app for smartphones will also launch in 2019. Spectre.ai is not your run-of-the-mill binary option/forex operator promising to revolutionize the industry through various "magic" solutions to problems that do not even exist. No. SPECTRE (which is short for Speculative Tokenized Trading Exchange) offers very serious solutions to fundamental problems plaguing the digital options and Fx trading industries. The more one reads into the Spectre.ai business case, the more obvious it becomes that if Spectre manage to follow through on their very ambitious plans, they may in fact disrupt and forever re-define the entire online binary option and forex trading industry. The concepts brought to the table by the Spectre team are extremely intriguing! Spectre.ai is a never-before-seen kind of digital (binary) option provider, marrying off blockchain technology - together with its smart-contacts ramification - with speculative derivatives trading at first, and then with classic fx trading further down the line. It is the fact that it sorts out every problem currently associated with the binary option scene that makes the operation so special. We can beat about the bush all day in this regard, but there is no denying the fact that the binary option trading industry is plagued by distrust. At a closer look, that may actually be an understatement. The current model pushed by the industry actors is so fundamentally flawed that it is unworkable from a realistic perspective. The conflict of interest on which this model is indeed based, cannot be defended by any rational and honest/objective person. We have a setup, in which the broker essentially trades against its own clients, on its own platform, where it controls the way the prices are made. Furthermore, it has full and unfettered control of the user's funds, and in some instances, it even dispatches its employees to "help" the clients it goes up against. As incredible as it may sound, Spectre.ai effectively addresses every single one of those problems. The blockchain based trading model it has set up, is simple and entirely feasible. As its first step towards revolutionizing the binary option trading model, Spectre removes the source of all the above described conflicts of interest from the equation: the broker. There are four distinct elements in every digital option/fx trading setup: the trader, who is the source of funds in the equation, the liquidity pool, which - according to the current model - is maintained and fully controlled by the broker, the broker, and the trading platform, where the actual price-making and trade execution occurs. Of these elements, the broker controls everything. Obviously, once the trader contributes to the liquidity pool through a deposit, he/she too will come under the control of the broker. Placed in such a position of overbearing authority, the broker can take advantage of a series of avenues for abuse. Since 100% of trader losses are 100% of its revenues, it is in the interest of the broker to have its traders lose as much as possible. In this regard, it can exert influence over the trader through its "account managers" who provide faulty advice and who will often not refrain from directly tampering with the trader's balance by making trades in his/her name. Having control over the liquidity pool, the broker can simply resort to refusing to honor withdrawals. Aggressive sales tactics are also used to trick traders into depositing more instead of withdrawing. Price making and trade execution is another wide-open opportunity for the broker to defraud its clients, by tampering with the price feed. Knowing all the above, it's easy to see how the majority (70-90%) of traders lose money through these brokerages. In fact, it is surprising that the above ratio is not 100%. Making use of the capabilities and nature of the Ethereum blockchain, Spectre.ai closes all those avenues for fraud, while the ICO actually gave birth to Spectre tokens that have some kind of use. As a matter of fact, according to the Spectre.ai business model, the tokens used for the business model are set to appreciate in time - more on that later though. The way Spectre.ai kills off fraud is simple. Instead of a broker, the entity maintaining the service will simply be what I'd call a "technology provider". As such, Spectre relinquishes control of the liquidity pool, which will be situated on the Ethereum blockchain and funded through an ICO. Every bit of ETH entering and leaving the pool will be controlled by verifiable and auditable smart contracts. This way, a 5th entity enters the above dissected equation: the ICO investors, who will also be token holders. These are the two entities who will pocket guaranteed revenues from the setup, namely 2% on the volume of trading taking place at the site (2% for the technology provider and 2% for the token holders, for a total of 4%). The remaining 96% of the traded volume remains in the liquidity pool. These revenues are cut off trading volumes, so they flow in, regardless of who wins and who loses a trade. Neither the token holders (who may as well be traders at the same time) nor the technology provider will trade against the client. The entity that will cover every trade is the impartial liquidity pool, which does not belong to anyone. That makes it clear that Spectre won't operate as a proper exchange (like NADEX does for instance), but there are plans in place that call for transition to that model over time. The price feed used by the trading platform originates from reputable and regularly audited sources such as OANDA. No one will have any control over the actual price making either (other than the above said sources) so that's yet another problem eliminated. The trader controls the exact sum of ETH he/she uses for trading. There is no need to make deposits or withdrawals though. All money matters are handled directly from the user's crypto wallet, and all winning shalls automatically land in the said wallet too. Smart contracts will handle this branch of the operation too, eliminating the human factor completely. With the need to make deposits and withdrawals gone, problems associated with these financial maneuvers are obviously eliminated as well. The above makes it all too clear that the currently used binary option trading business model is hopelessly outclassed by the above detailed, blockchain-based design. Traders who are not familiar with cryptocurrency can also choose to use a centralized wallet which can be funded with fiat money. In this way, you can trade on the trustworthy platform, but you will have to deposit and withdraw your money like you're used to with your classic broker. If you have paid attention thus far, you've probably asked the question: how will the liquidity pool be maintained? Suppose a huge number of traders log wildly successful trading sessions and they bleed the pool dry... As soon as that happens, the whole design comes crashing down. Indeed. That is exactly why such an eventuality has to be avoided at all cost. Fortunately, from a mathematical and statistical perspective, such a possibility can be ruled out almost completely. These guys have done their homework research-wise, and they know that the average winning rates for a large and diverse trader pool are in the neighborhood of 48-53%. Given how payouts on winning trades are in the 75-93% range, while 96% of losing trades remain in the pool, it is obvious that traders who do not hit the 57% success rate, won't be able to break even. The numbers most certainly do not lie: this way, the liquidity pool won't just be maintained (remember, the 4% handed out in dividends to the tech provider and the investors has already been subtracted), it will continuously grow. This makes it possible to give certain token holders a special dividend too, at the end of the year, provided the liquidity pool grows past a certain pre-determined size. This is where the only conceivable Achilles' heel of the operation resides. While - as shown above - the liquidity pool is guaranteed to grow over time (thus indirectly raising the value of investor tokens), it is undeniable that it is still in the interest of the tech provider and the investors, to have traders lose. The more traders lose, the faster the liquidity pool will grow, the more the various tokens will be worth and the more money investors will pick up in yearly dividends. This is exactly why there needs to be a solid auditing entity behind the setup, which makes certain that the system of smart contracts governing Spectre is indeed 100% fair and infallible. Those who took part in the funding ICO of the liquidity pool have been offered two types of tokens. These tokens are set to be traded through different exchanges. Dividend tokens give holders the right to pick up regular (2% commission-based) and special (yearly, liquidity-pool-growth dependant) dividends or 'rewards'. This is fairly clear as explained above. The other token-type is the utility-token, which, unlike its reward-focused counterpart, does not give its holders payouts, but rather various privileges on the SPECTRE platform. These tokens will arguably be more suited to investors who become traders at the site too. Such privileges are increased payout rates on various underlying asset-classes, access to the full asset-selection, an expanded selection of technical analysis indicators, trade types other than the square Put/Call ones and access to the trading academy offered by the site. In essence, these tokens will represent a sort of VIP-account access for those possessing them. In regards to the utility tokens: to boost their value, Spectre plan to use some 3% of the fees generated by the system, to buy back tokens. The limit on these buyback programs is 15% of the outstanding supply. From a mechanical perspective, it is obvious that Spectre will not have traders cover other traders' investments. As said above, the entity covering these trades is the liquidity pool. While on one hand this means that Spectre cannot be defined as an exchange, on the other, it means that the project will not encounter liquidity-related issues that make the launching of new exchanges borderline impossible (problems in this regard surface when there are just not enough traders to cover a trade you're looking to make). The Spectre model works perfectly with a single trader, a handful, or millions of them. This is exactly why maintaining perpetual liquidity in the pool is so important. Over time, as more and more traders join Spectre, the stage where the algorithm is capable of matching trades up perfectly, will indeed be reached. At that point, Spectre will become an exchange, in the vein of NADEX and others. The Spectre business model doesn't just set the foundations of a digital (smart) option operation that is in every way the superior of its current-day peers, it actually gives birth to a dynamic, evolving entity, which grows and improves over time, as its trader-base grows. For the foreseeable future though, it is obvious that the size of its liquidity pool will determine the capabilities of the Spectre trading system. At a $3 million size, the pool will be able to match the trades of some 1,000 traders, who make 6 trades of $50 each per day. The trader winning percentage it will be able to weather is 59%, well over the statistically maxed-out 53% mark mentioned above. The Spectre trading platform and system is currently available with smart options only. The new user interface makes quite an impression. Graphically pleasing and highly functional, the trading interface allows the trading of a bunch of currency pairs. It all looks and feels like a regular digital option trading platform, so those who have already traded such options will find it very familiar. Pending orders can be placed without any obligation, directly on the chart, there is a handy chat window, and the Account Settings section offers a massive number of options, ranging from risk management templates to various audio settings. There is a Trade Ideas panel featured in the trading interface, the settings of which can be tampered with in the Account Settings section. The trade idea section includes strategies such as Battleground, Breakout and Dead Cat Bounce - among others. Performance reports are delivered to the email address provided upon signup. The frequency of these reports can also be set in the Account Settings section. Daily Stop Losses, Win Stops and Time Outs can also be set from the Risk Management panel. The Analytics section offers a number of personal statistics, including ITM rate, ROI and drawdown, and while indicators such as the RSI and the Bollinger Bands are made available directly on the chart (by default) there don't seem to be nearly enough tools available in this regard. Since blockchain is quite new for the authorities, Spectre is obviously not regulated yet. The regulatory issue is part of the project roadmap though. It is indeed the penultimate step before the launching of the system. Apparently MiFID regulation will be targeted through CySEC, BAFIN or the UK's FCA. US regulation is not yet part of the picture in any shape or form, although once exchange-status is achieved, it may just make sense for the operation to move in this direction. 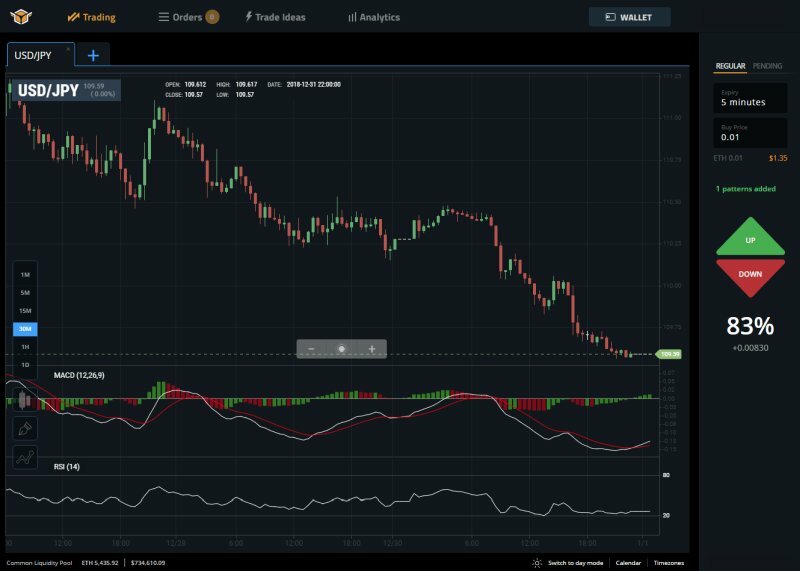 Spectre.ai represents a daring foray into the future of binary option (and eventually square Fx) trading, on the wings of the blockchain revolution. As presented by Spectre, the technology is indeed wonderfully suited to turning binary options into the legitimate investment vehicle they should always have been. In its current form, Spectre feels like a very straightforward binary option destination. Most of the magic is indeed under the hood, but it works like a charm. US citizens cannot trade at Spectre. The two Spectre tokens are called SXDT and SXUT respectively (D for Dividend and U for Utility). Both tokens are ERC20 compliant and can be stored in ETH wallets.